One of the reasons why I had bought black rice during my visit to Bali was to try out the simple and yet so flavorful pudding that is so common to find on menus in the restaurants around Bali. Sometime back I had posted a red rice kheer and a black rice salad recipe. I kept on getting comments that fellow bloggers had not used red or black rice. It was my turn to choose the #156th theme. I thought let the group get an opportunity to try out rice other than white which they’ve not used. For me it was simple, out came the packet of forbidden rice as its also called to make the pudding. This sticky rice produced by heirloom plants in Indonesia, China and Thailand, is packed with antioxidants from anthocyanin, which is also found in blueberries and other purple colored foods. Yes this rice is actually deep purple in colour rather than black. It is believed that during the Ming dynasty in China, only the Emperors were allowed to eat black rice and hence the name forbidden rice. Besides the antioxidant which helps to fight inflammation, free radicals, and improves brain and cardiovascular functions, black rice is a rich source of zinc, copper, iron and dietary fibers. I loved the pudding with sweet mango as it was a good healthy sweet dessert treat and yet so light on the stomach.Hubby dear had already made up his mind that the dessert is not going to be good! When I served it to him, he screwed up his nose and yet finished his portion. Asked for some more. Of course I have no words! If you find that the mixture has dried up a bit add more coconut milk and enjoy or serve it with whipped coconut cream. Here’s the recipe for a gluten free, vegan dessert. Soak the rice overnight in some water. This will help to cut down the cooking time. Next day drain out the water, wash the rice. Add rice and measured water in a deep pan. Place it over high heat and let the water come to a boil. Lower the heat and let the mixture simmer. Stir the rice occasionally so that it does not stick to the bottom of the pan. When the water becomes less, add the coconut milk and continue cooking. When the mixture becomes thick add the salt and palm sugar. Let it cook for another 5 minutes. At this stage if you find the mixture too dry or thick add little water or coconut milk. Add extract or pandan essence and stir well. Serve hot or cold with some chopped mango. This pudding can be made with sticky white rice. Use brown sugar, jaggery, maple syrup, honey, coconut sugar if you don’t have any palm sugar. Can use other fresh fruits to serve this pudding. If you want to use fresh pandan leaves, tie them up in a knot and add to the boiling water and rice mixture. Remove once the pudding is done. Enjoy this pudding as breakfast, load it up with fruits, nuts and seeds. The black rice pudding with that fresh juicy mango is looking so inviting di ! Need to try out the red and black rice varieties soon. Now that I’m have a full proof recipe will give it a try for sure. Thanks Poonam, both are unique in texture and tasty. Wow such an amazing and unique recipe. Can’t wait to try the recipe.Thanks for sharing such a unique and delicious recipe. From the Pudding to the crockery ,Everything looks so perfect…have to give this recipe a try…never made anything with black rice. Thank you Saswati, and with coconut milk it tastes awesome, try out the recipe. Firstly, fab theme I must say and there is so much more than White Rice. Loved the props and the colour combinations. The mangoes lend a lovely smooth texture and taste to the pudding. I am yet to experience Black Rice in a full fledged way and this post is surely encouraging me to do that. Putting this on my next grocery shopping list. Black rice pudding with mango looks so tempting. Loved your bowl. Beautiful click Wonderful share for the theme . I have not cooked with black rice so this is a new dish for me Mayuri. Looks stunning and sounds yummy! Thanks Sandhya, do try it out. The combination of flavours in this dish just lipsmacking good can feel it on my tastebuds just by reading about it . OMG! I love everything about this recipe right from the pictures to the way you have cooked the pudding! Wish I can get some forbidden rice to try this recipe out. Thanks Archana. You could try amazon, maybe they sell it. Thats a delightful pudding, am yet to make dessert like this with exotic fruit with black rice. Lipsmacking here Mayuri. Very interesting variety of rice! Need to try this one…awesome share dear 🙂 Love the combo with mangoes! Thanks Freda, please do try it. i love black rice kheer, the mangoes incorporated one looks even more delish.. Pretty and lovely colours. Love your detailed posts! The jet black pudding topped with yellow mangoes looks insanely attractive! Never used black rice but now I am genuinely interested.It will give such a dramatic affect to the pictures. Amazing! Mallika not only does it give it a dramatic effect for pictures, the rice tastes so different and earthy. We loved it. Love black rice in savoury dishes but have not use in desserts, I must try this recipe, so tempting. Thanks Jagruti. Do try black rice , its tasty. When you say mango, I will be there..I never cooked black rice…the pudding looks amazing though with the mangoes, it should taste great. Surely this pudding is super healthy and makes a great dessert. I have not used black rice so far. Looking delicious. Thanks Bhawana.Use black rice, its really different and tasty. Yes things beyond our limits fascinate us and so did the black rice. 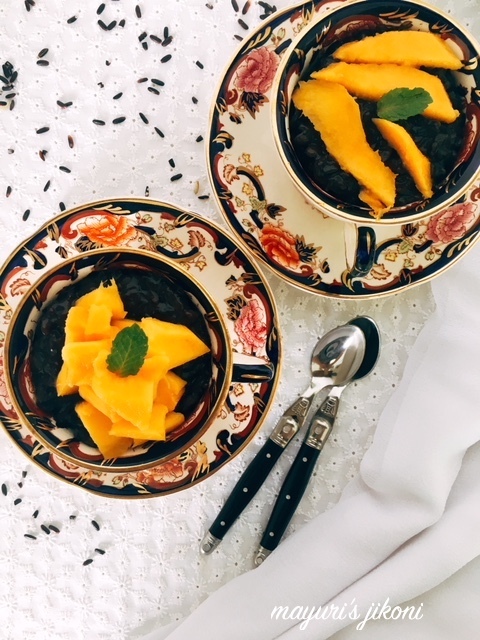 This Black rice pudding with Mango looks fabulous.I am yet to try black rice.Your clicks are making it more tempting. Thanks Lathiya and yes it tastes really good. Never ever in my dreams i could have think something similar… heard of black burger but the black rice pudding – Insanely innovative… Thanks for inspiring! Have also tasted black burger, and black rice pudding is a common dessert in Indonesia.